I took the recipe from public Just cook! in vkontakte. Family happy, because here combines favorite taste of chocolate and apples!!! Mix room temperature butter with flour and cocoa. Add sugar and 2 eggs, vanillin. Pour 1 tbsp of icy water. Knead dough. From half of dough, in round split form greased with butter, make bottom and sides of 5 mm thick. Put the rest of dough in fridge. Wash apples, peel and cut in squares (as potatoes for borscht). Heat butter in saucepan, spread half of apples, pour cinnamon. Cook till soft state. Turn off the heat. Add rest of apples, pieces of chocolate. Pierce basis with fork and spread stuffing. Roll remaining dough, cut off with cookie molds for cake decor. Spread layer on apples. Sprinkle with sugar and bake for 35-40 min till crispy crust at 180 ℃. 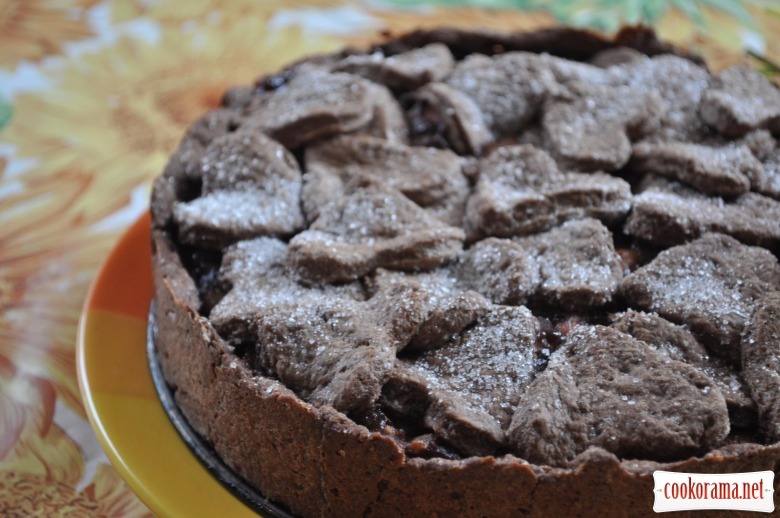 Top of recipe "Chocolate-apple cake into hearts"